Amazon has expanded its Prime Member benefit program, extending the shipping benefits to merchant-fulfilled listings. Sellers who have proven their ability to meet Prime customers' expectations for service can now enroll in Seller Fulfilled Prime. Learn about eligibility and program requirements (requires login). With Prime orders, you do not ship from your own account; instead, you purchase a shipping label from Amazon. This is done through SellerCloud, as explained below. By default, label purchases are billed at Amazon's shipping rates. However, if you have an account with Stamps.com or UPS, you can link your Amazon seller account to your carrier account to use your own negotiated shipping rates. Read about it here. Open Amazon SellerCentral > Orders > Order Reports > See the top note "New! Choose the columns you want to see in your order reports." Click "Add or remove order report columns" to open the Add Or Remove Order Report Columns page. Choose the columns you want to apply to all future reports. Enable the Is Prime? column. You must enable this column to be sent in your order report before using Seller Fulfilled Prime through SellerCloud. 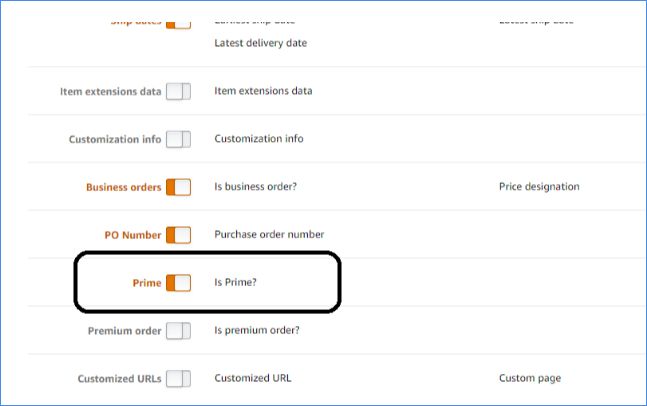 Products must be marked as "Prime" to be purchased as a prime order. This is done on Seller Central by choosing a Prime Delivery-enabled shipping template on the product. Templates are configured under Settings > Shipping Settings; the configuration procedure is available here. Select and enable shipping services in Seller Central. Only services that are enabled are available for selection in SellerCloud. API Registration for Shipping Services can be enabled on Seller Central here. If preferable, enter your shipping account information to use your own rates. Enable SellerCloud's Client Setting Enable Generate Shipping Labels via Amazon. Enter your AWS credentials. You can take them from your Amazon Settings page. See your credentials here. If you have multiple Amazon accounts doing Seller Fulfilled Prime, click Per-company configuration to enter your credentials. Choose a Printer, and if thermal, check Printer is thermal. Important! Be sure to double-check your printer's settings and ensure that its paper stock is set to output to 4x6. Choose a default Delivery Experience (Signature confirmation, etc.). Click Save. ShipBridge will now prevent Prime orders from being shipped with the regular shipping services. In ShipBridge, click Menu > Customize Interface > Filters > check AmazonPrime and uncheck Weight Verified. Select the Prime order in ShipBridge. Right-click and choose Calculate Rates. This is the equivalent to "Get Eligible Services" when Shipping thru Seller Central or SellerCloud. Only Amazon services will appear in the grid; select a service. Ship order. This will "Buy Postage" from Amazon, and return a valid shipping label. Orders for the Prime items will download into SellerCloud with the regular order download. Order will have a status of "Prime" at the top of the Order Status panel at left. Prime orders can be filtered using the Order Subtype filter > Prime. This filter can be activated by enabling the Client Setting Enable Order Sub Types. From the Action Menu > Choose Buy/Cancel Shipping From Amazon. On the following page, complete the request form: Package dimensions, weight, and Ship From address (defaults to company address) are required. On the following page, select a ship method. The Amazon rate charges show on the right column. If you configured Stamps.com in Seller Central, those services will also be available for purchase. Press Buy Shipping. The order will be updated as Shipped with tracking in SellerCloud and in Seller Central. On the following page, download the shipping label. You can also cancel the label. This will not mark the order as cancelled/refund or unshipped on Amazon; it just voids the shipping label and you must generate a new one. Canceling the label will set the orders as Unshipped in SellerCloud. The order will still have a shipped status on Seller Central because there are downstream dependencies that Amazon does not want to break and moves it to an unshipped state. If you prefer to ship Prime orders without buying the labels from Amazon, you can enable SellerCloud's Client Setting Allow shipping Amazon Prime orders manually. We will still upload the tracking to Amazon. This will only work if you get special clearance from Amazon that they allow you to ship MFN Prime Orders without buying the labels directly from Amazon. In SellerCloud, go to Settings > Warehouses, and choose the warehouses you will ship from and set their address correctly. In ShipBridge, go to Menu > Options > Shipping and enable Use Warehouse Address > Save. This allows SellerCloud and ShipBridge to obtain and apply the FedEx rates from Amazon.